As I reported in a previous entry, we didn't have any luck obtaining phosphopeptides with the Pierce Gallium Swell Disk cartridges (except for enriching acetylated peptides). This is a bit of a consensus, mentioning this kit actually brought an unintentional smirk from one of the company's employees. Therefore, we were hesitant to try Pierce's new columns, the supposedly complementary Fe-NTA IMAC columns and the TiO2 spin columns. We took a gamble on them because they were very easy to use, and this postdoc is wearing far too many hats to try packing his own gel-loading pipette tips with enrichment resin. Yes, the results are complementary. Yes, they resulted in more than 600 unique phosphopeptides. I would be completely satisfied by these two enrichment methods (that are very easy, btw), if the filter aided capture and elution (FACE) technique hadn't produced over 1,000 unique phosphopeptides on its own. And as easy as these two techniques are, the FACE technique is easier and cheaper. 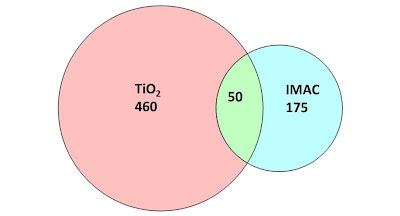 Fortunately, the results are completely complementary with FACE as over 90% of the phosphopeptides found by TiO2 and IMAC are phospho-serine and phospho-threonine, while 95% of the phosphopeptides from FACE are the rare (and incredibly important) phospho-tyrosines. 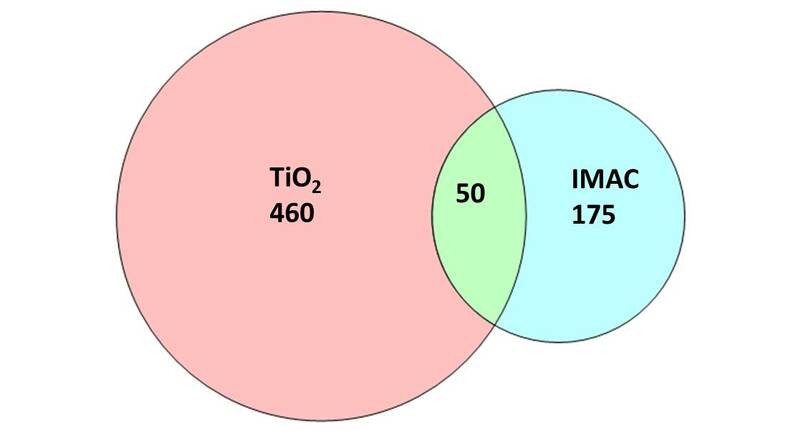 Summary: If you want to get a great phosphopeptide enrichment, perform FACE, then TiO2 on the flowthrough followed by IMAC enrichment of that flowthrough. I've been spending the weekend reviewing some data from a while ago for something I meant to evaluate further. Pierce used to sell a phosphopeptide enrichment kit that used 'gallium swell disks' to capture and selectively elute phosphopeptides. When I first used this kit last year I remember being surprised by the number of acetylated peptides. Looking at the data further suggests that this kit may actually be better at enriching acetylated peptides than phosphorylated ones. Too bad they don't make it anymore, because it might be a nice tool if one were going after the acetylome.